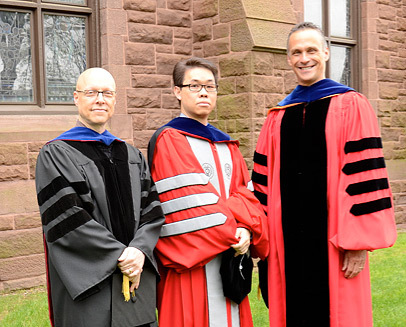 President Roth, at right, honored Scott Plous, professor of psychology, and Wai Kiu Chan, associate professor of mathematics, with the Binswanger Award. Scott Higgins, associate professor of film studies, also received the award. 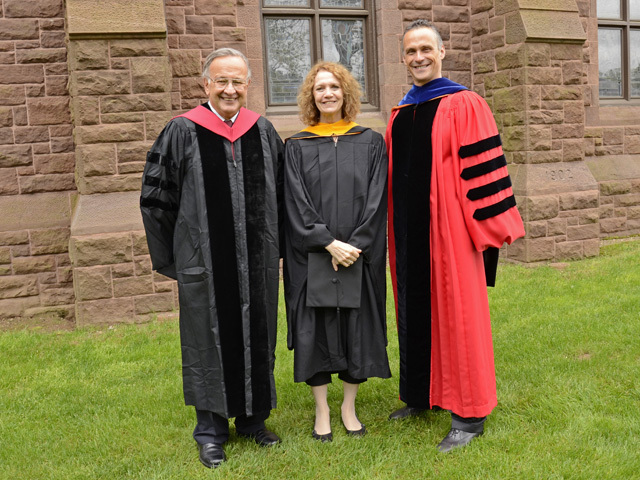 Every year Wesleyan recognizes outstanding teaching with three prizes awarded at Commencement. These prizes, made possible by gifts from the family of the late Frank G. Binswanger Sr., Hon. 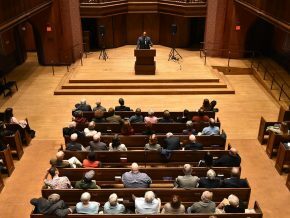 ’85, underscore Wesleyan’s commitment to its scholar-teachers, who are responsible for the university’s distinctive approach to liberal arts education. 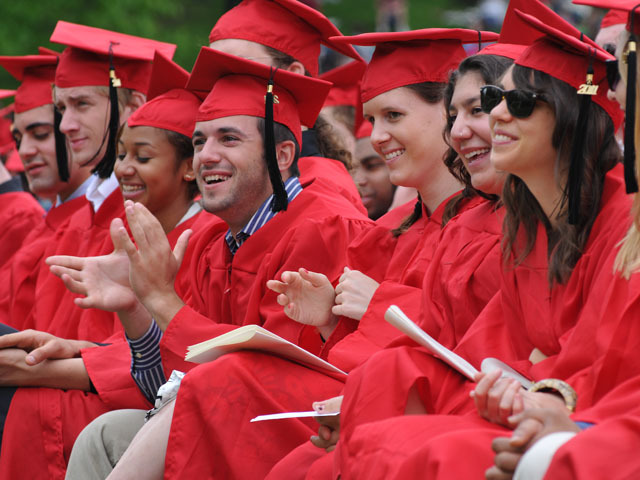 Recommendations are solicited from alumni of the last 10 graduating classes, current juniors and seniors, and current graduate students. 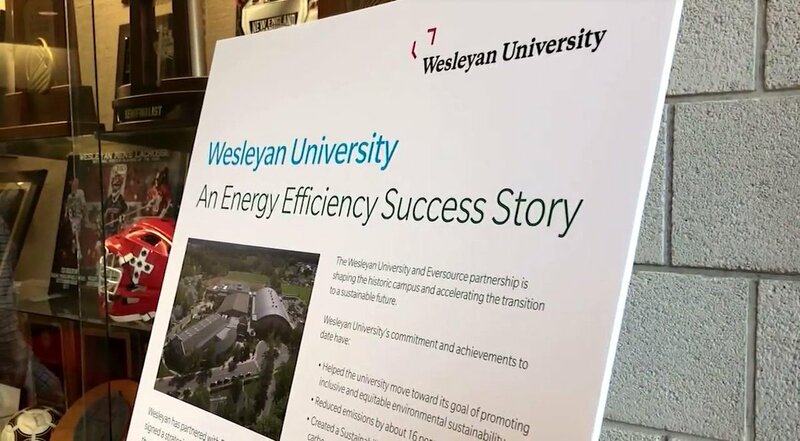 Recipients are chosen by a selection committee of emeriti and current faculty members, as well as members of the Alumni Association Executive Committee. 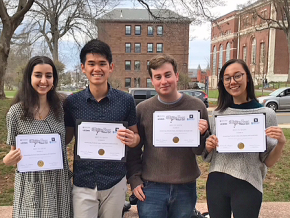 This year, Wesleyan honored Wai Kiu Chan, associate professor of mathematics; Scott Higgins, associate professor of film studies; and Scott Plous, professor of psychology, for their excellence in teaching. 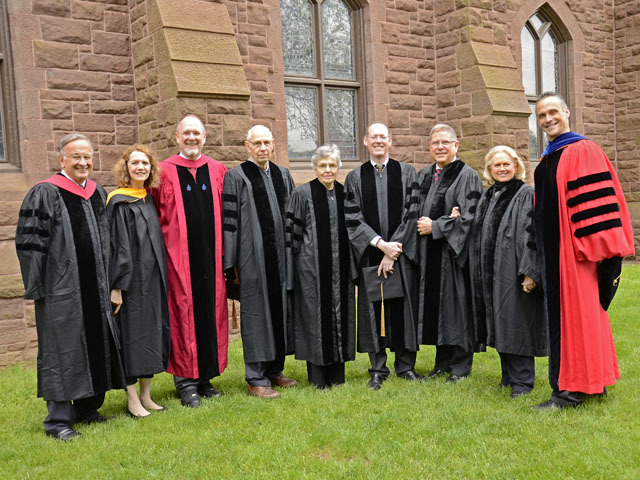 Honorary Degree Recipients, from left, are Robert Patricelli '61, P'88, P'90, Margaret Sweetland Patricelli, Joshua S. Boger '73, P'06, P'09, Ralph "Biff" H. Shaw '51, P'79, Jean Adams Shaw P'79, Dr. Paul E. Farmer, Alberto Ibarguen '66, P'97 and Barbara Nell Cook. 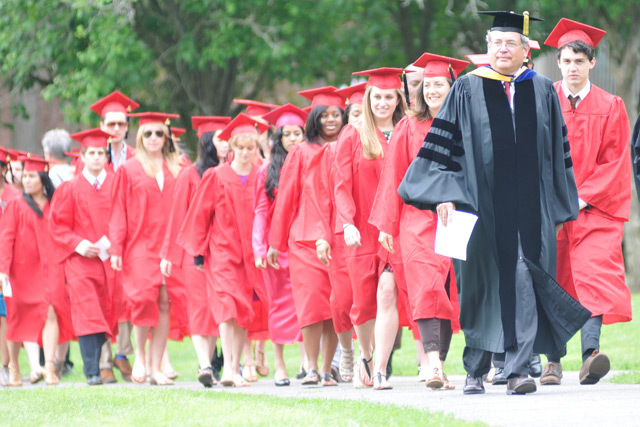 President Michael Roth '78 is pictured on the right. Paul Farmer received a Doctor of Science during the 2011 Commencement. Farmer is an inspirational scholar, doctor, teacher, and leader. As a physician-anthropologist, he has dedicated his life to serving the world’s poor and to raising the standard of health care around the world. In 1983 he co-founded Partners In Health, an international nonprofit organization that provides direct health care services and undertakes research and advocacy activities on behalf of those who are sick and living in poverty. 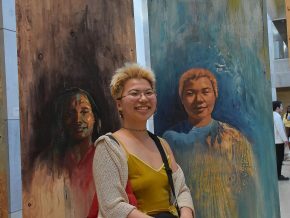 His work focuses on community-based treatment strategies for infectious diseases, health and human rights, and the role of social inequalities in determining disease distribution and outcomes. Dr. Farmer and his colleagues have successfully challenged the policymakers and critics who claim that quality health care is impossible to deliver in resource-poor settings. Dr. Farmer is the Kolokotrones University Professor and Chair of the Department of Global Health and Social Medicine at Harvard Medical School; Chief of the Division of Global Health Equity at Brigham and Women’s Hospital; and United Nations Deputy Special Envoy for Haiti, under Special Envoy Bill Clinton. T. S. Eliot’s Four Quartets all cycle around the theme of beginning with a kind of solemnity that’s both attentive and introspective. He looks out as the dawn points—out to the almost-day to feel the wind wrinkle and slide. He looks in and finds himself here, or there, or elsewhere. 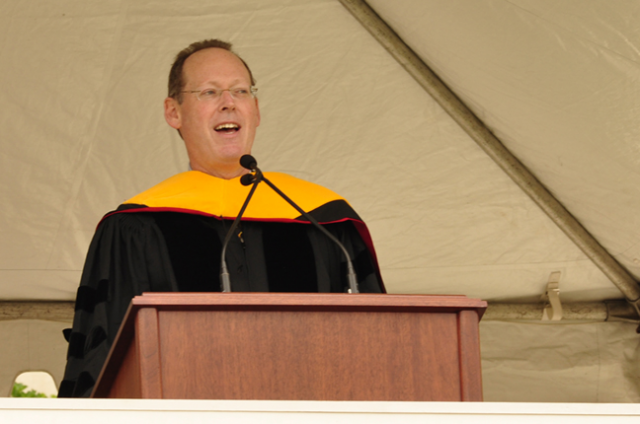 Dr. Paul Farmer delivers the Commencement Address. 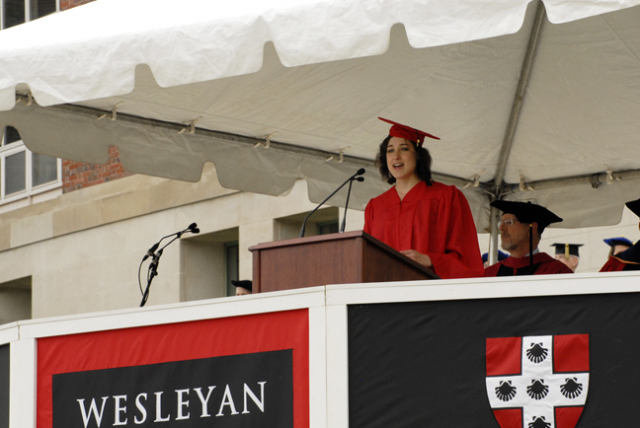 View additional photos of Reunion & Commencement Weekend on Wesleyan’s Flickr site. 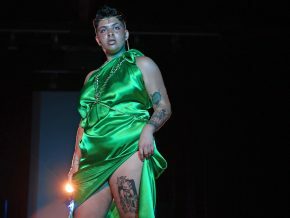 The Parade of Classes begins at 11:15 a.m. May 20. The annual event is a popular event during Reunion & Commencement Weekend. 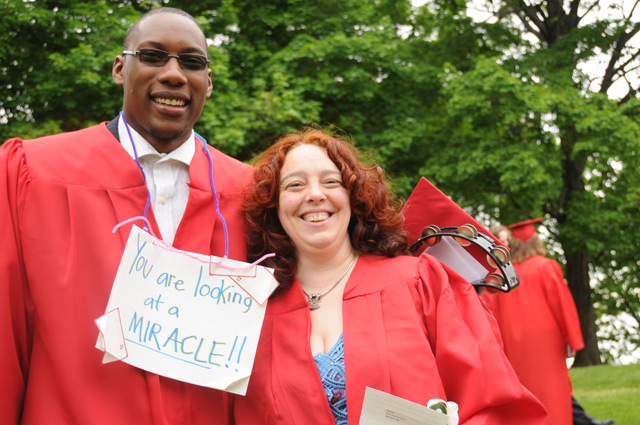 Celebrate graduating seniors and reminisce with former classmates during the 2011 Reunion & Commencement Weekend May 19-22. 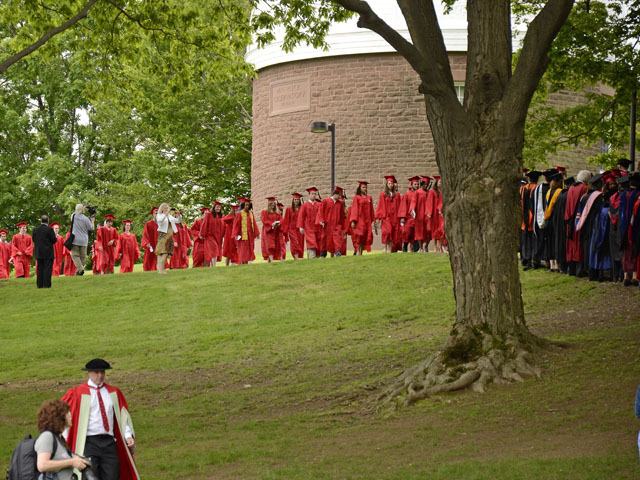 This year, classes ending in “1” and “6” will celebrate their reunions, and the Class of 2011 will become Wesleyan’s 179th graduating class. Registration begins at 10 a.m. May 19 in Usdan University Center. Alumni, parents, students and families should check in for a final weekend schedule, meal tickets, a welcome packet, campus maps and more. 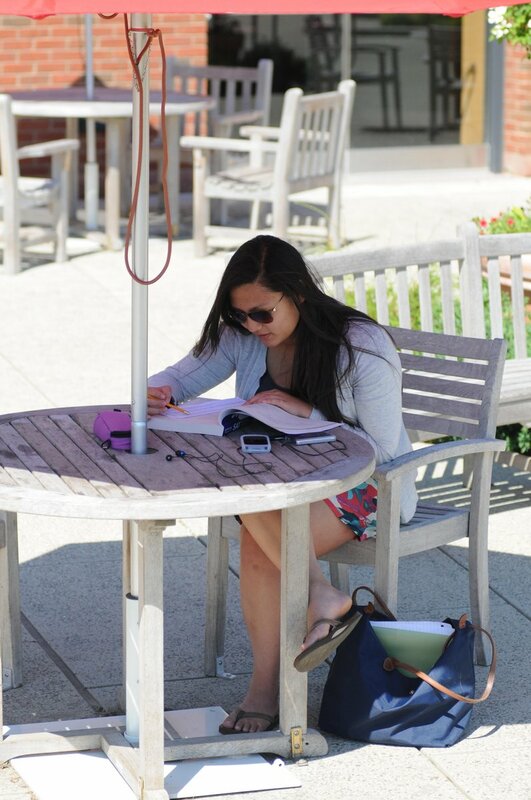 Campus tours begin at 9 a.m. and noon on May 20 at the Office of Admission. The entire May 19 schedule is online here. 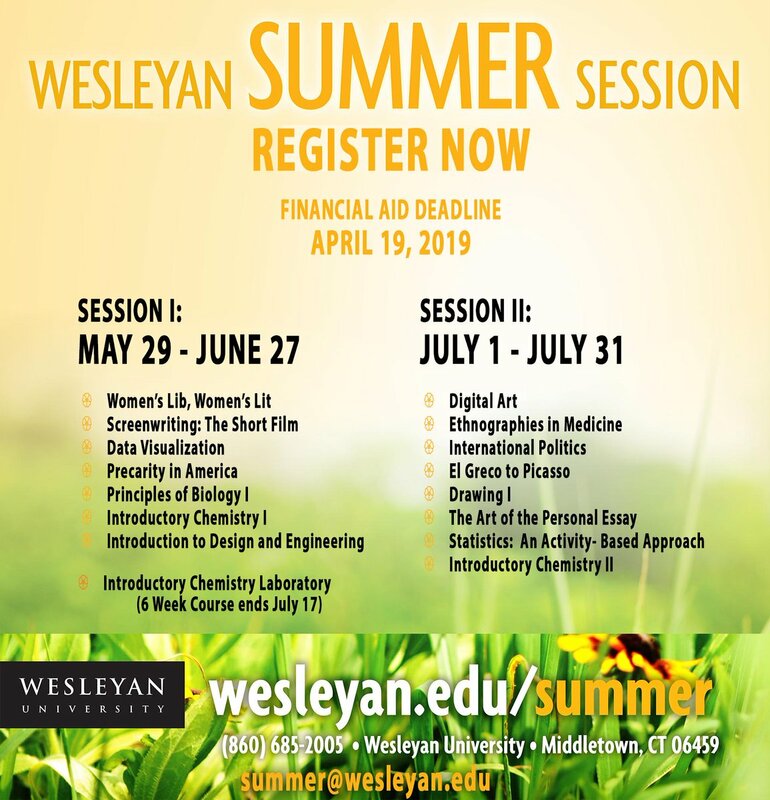 Wesleyan’s interactive and inspiring WESeminar program begins at 11:30 a.m. May 20 with the topic “How to Learn to Like the Art You Love to Hate.” WESeminars provide opportunities to revisit the classroom and experience firsthand the academic excellence that is the essence of Wesleyan, with presentations by scholars, pundits, and other experts in their fields. 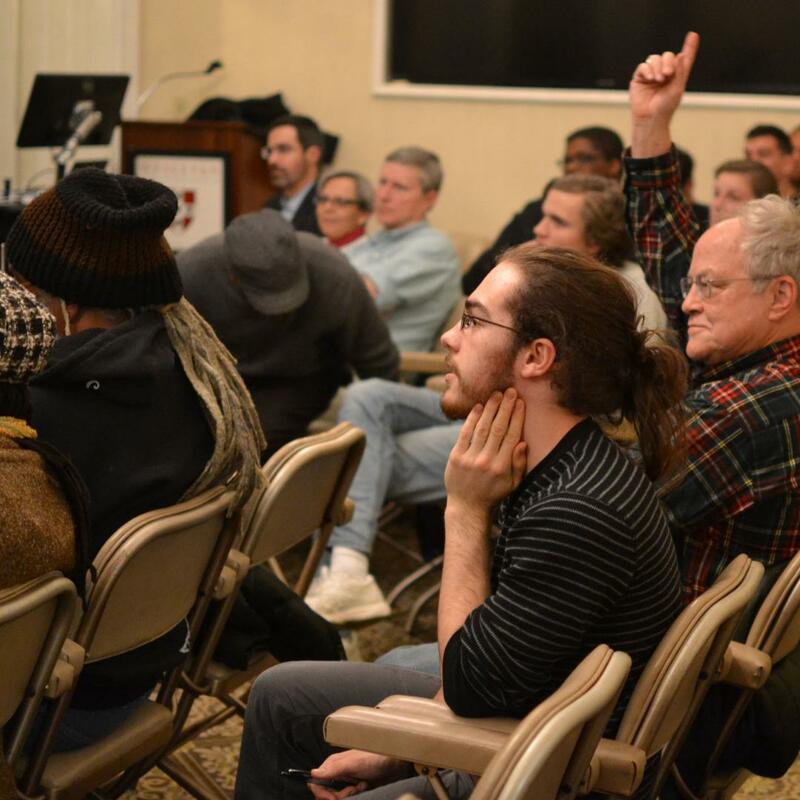 Programs run approximately 60 minutes, followed by audience Q&A. 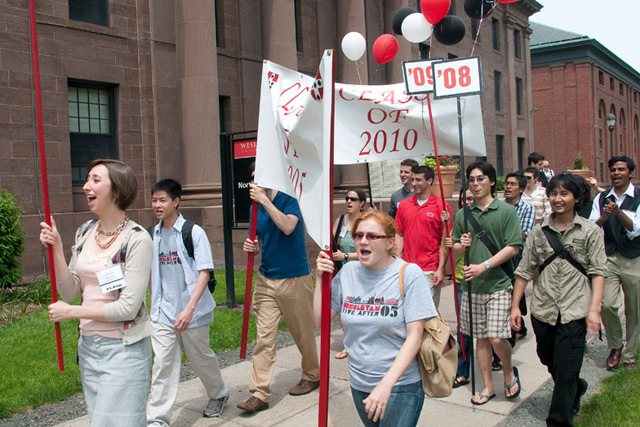 Other topics this year include Immigration Policy, Principles and Politics; Space Weather; Community Partnership and Scholarship at Wesleyan; Re-Branding Russia; The Ocean’s Oddest Creatures; The Wesleyan Media Project’s 2010 Analysis of Political Advertising; Thinking Critically about the Environment; The State of Queer Connecticut; Negotiation Skills; Japanese Printmaking; Wesleyan Alumni in Philanthropy and Public Service; and many more. 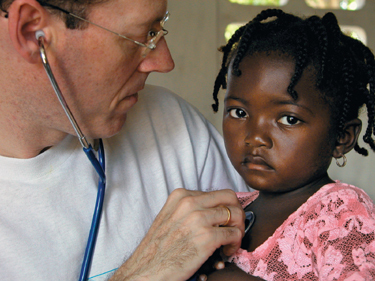 Paul Farmer is one of the founders of Partners In Health, an international health and social justice organization. 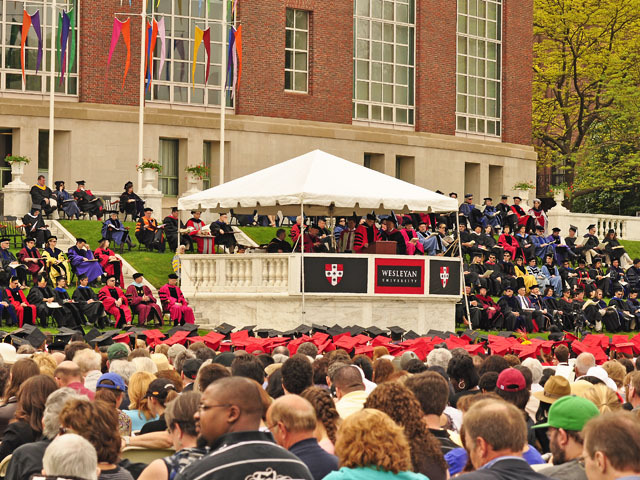 Dr. Paul Farmer, known worldwide for co-founding Partners In Health to serve the world’s poor, will receive an honorary degree and deliver the commencement address at Wesleyan University’s 179th Commencement in May. 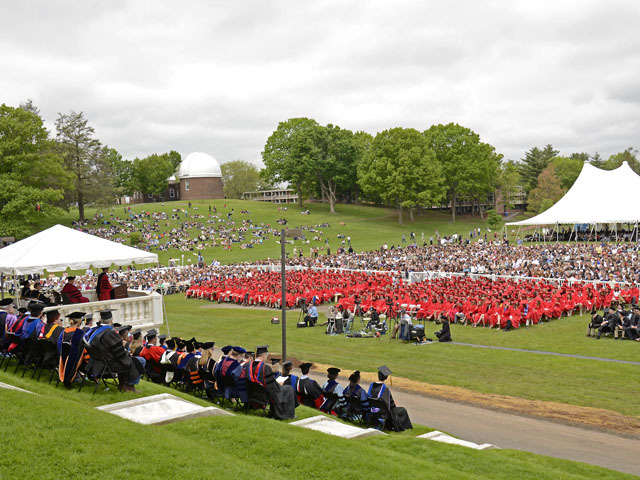 Wesleyan’s other honorary degree recipients at Commencement include a legendary singer of the American Songbook, an alumnus envisioning the future of online journalism, and two local friends of the institution long dedicated to serving the Middletown community.